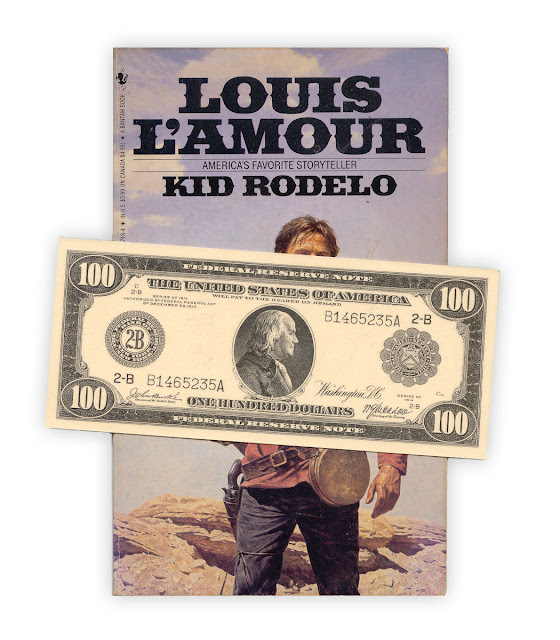 Found in "Kid Rodelo" by Louis L'Amour. Published by Bantam, 1989. Is it worth more or less than the 10 cent note your featured earlier in the week?? Too bad it ain't a Silver Certificate! Mind sharing a bit of the wealth? A reward perhaps for enjoying a classic? This is fantastic! You might want to get it appraised for the value of it's history alone. I wish you could post the other side as well! I collect old coins and am always intrigued by old currency...luck you! Heh... I should have made myself more clear. It's just a bookmark, a replica $100 bill laminated in plastic. The back has a barcode.